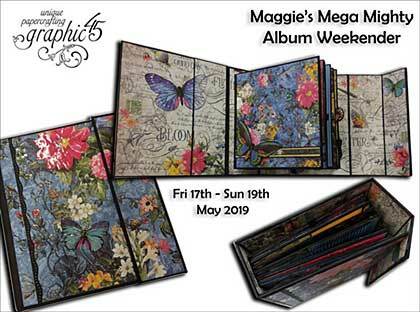 Event: Maggie's Mighty Album Weekender - Create a mighty 'Fold Over' album masterpiece. We are all loving making mini albums currently, so what better way to enjoy a weekend than to step it up a notch and make a mega, mighty album - something beefy and full of interactive flips and flaps. Let Maggie show you how - a lady of multiple crafting talents. You will create your album from scratch using just black cardstock, tape and greyboard. It's an amazing feeling seeing your album come to life. You'll decorate your mighty album with one of the latest gorgeous paper collections from Graphic 45 called 'Flutter'. Be prepare for a full-on, productive but fun and 'feel-good' weekend. Sat 10am-6pm: with all the prep work complete from last night, we'll finish the album construction today and start with all the fun decorating and embellishing. (Bring your packed lunch). Sun 10am-4pm: Carrying on where we left off from yesterday, we'll have more fun decorating the album today and complete our project, ready to take home and wow your friends and family. (Bring your packed lunch). 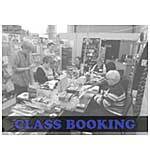 A basic tool kit is recommended to bring with you, and this will be emailed to you nearer the time. no accommodation included - suggestions can be provided upon request.